Reporters for "Sports Dong-A," recently took a look at K-Pop in Europe. 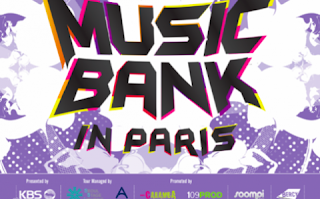 As you know, Music Bank just recently held its Music Bank in Paris event, and last year SM Entertainment held SM Town in Paris, opening the doors for other Korean artists to follow. 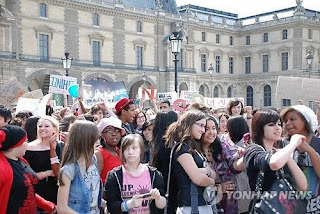 The reporters looked around France for evidence of the spread of K-Pop. What they found were fans who hoped to buy K-Pop CDs at their local stores. One fan said, "I want to buy 2PM's album in France." A trip to France's Virgin Mega Store and a talk with a store employee revealed that over the past year, a large number of K-Pop fans in their teens have been asking the store to stock Korean CDs. However, Japanese Pop (J-Pop) is still by far more well known and popular than K-Pop. The reporters seemed slightly disappointed that there wasn't more Korean CDs in Paris, but they were encouraged by seeing Korean movies and comics displayed in stores. 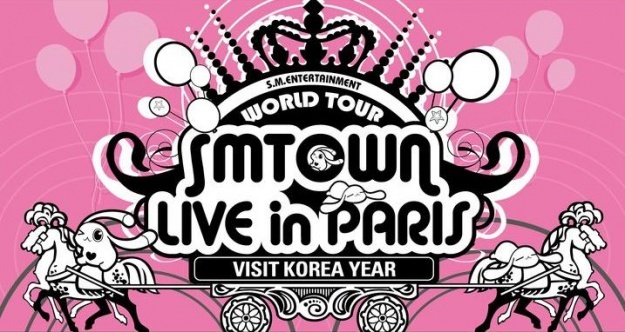 As we have seen, European K-Pop fans are increasingly vocal about having access to K-Pop CDs. As more fans take to the internet and to the entertainment companies themselves and demand more availability, it should rise in due course. But, with a rise in K-Popularity, comes the issue of whether or not overseas fans actually want their favorite stars to be very well-known overseas. Fans have voiced concerns over the possible Americanization of groups like 2NE1 and Wonder Girls if they are to become popular in the US. Fans have also worried about the health of artists as they travel from one country to another. My question for you all is, "How far do you want K-Popularity to spread in your country? In the world?"